With the City of Middleton hoping to claim a swath of land from the Town of Middleton for a new development, the town recently started investigating the possibility of incorporating in an effort to protect its borders. In response, the city moved swiftly to approve a pre-annexation agreement that serves as an early but key step toward realizing the proposed 162-acre Pleasant View Ridge subdivision. The pre-annexation agreement with Erdman Real Estate Holdings, Llc., was approved at a special meeting of the city council on May 14. Erdman Holdings recently unveiled Pleasant View Ridge, a project that would include 104 single-family lots. One unique aspect of the Pleasant View Ridge proposal is that it calls for a combination of individual and community septic services, which are typically used by towns, rather than the urban services most developers annex into cities to obtain. Calling it “doing our due diligence,” the Middleton Town Board has asked staff to explore alternatives to contracting with Middleton Emergency Medical Service, including Ryan Brothers Ambulance. While the town has contracted with Middleton EMS for decades the increasing cost, lack of timely information and Ryan Brothers new Middleton location prompted the board to seek options, said Town Chairman Milo Breunig. Two years ago, the Middleton EMS contract “took a huge hike” to about $182,000 annually billed in quarterly installments, said Breunig. Meanwhile, information on the number of service calls involving town residents has been “hard to get,” he said. An ordinance that would require city contractors to provide domestic partner benefits provoked a heated discussion by the Middleton Common Council last week. Disagreement over the proposed rule’s necessity sparked debate over an issue that carries both social and fiscal significance. Ald. Mark Sullivan (Dist. 8) questioned the long-term monetary impact this ordinance would have upon the city. Sullivan asked that the matter be referred to the public works and finance committees in order to “analyze the ordinance’s impact” and assess what implications the change might produce downstream. When advocating for the ordinance, ald. JoAnna Richard (Dist. 3) expressed frustration with Sullivan’s recommendation, saying “the change does not incur additional costs.” Richard said the ordinance would simply enable domestic partners to jump onto already existing benefit plans. Ald. Jim Wexler (Dist. 4) walked out of Tuesday night’s Middleton Finance Committee meeting after losing his chairmanship, choosing not to return for the Middleton Common Council meeting that followed. It was the first time he missed a regular meeting of the common council in more than two decades. The finance committee voted to make District 8 Ald. Mark Sullivan, a Certified Public Accountant, its new chairman. Wexler said he was dismayed by the committee’s “lack of integrity,” calling District 5 Ald. Howard Teal, who nominated Sullivan, a “bully” for his handling of the process. Wexler said Teal worked behind the scenes to oust him from the seat at the head of the finance committee in retaliation for Wexler’s support of Ald. Susan West (Dist. 6), who was voted president of the common council in April. West replaced Teal, who had served as council president for five years. 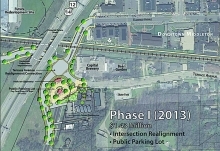 Plans to redevelop Terrace Avenue and North High Point Road were turned on their head last week when the Middleton Common Council abruptly decided to proceed with phase two of the project before it tackles phase one. The new plan is markedly different than any of the three options recommended by the Middleton Plan Commission seven says earlier. Phase two involves rebuilding Terrace Avenue between Parmenter Street and North High Point Road. The project, which would be funded using Tax Increment Financing and cost an estimated $2.8 million, includes new sewer and water utilities and a new streetscape using decorative bricks to match pedestrian friendly areas elsewhere in the downtown. Construction is slated to begin in 2014. The Middleton Town Board will look into its options for incorporation or taking steps to otherwise block Erdman Holdings, Inc’s plans to annex 160 acres from the town into the City of Middleton. On Monday, the board agreed to place hiring an attorney on its May 6 meeting agenda, at the suggestion of town attorney Tom Voss. Erdman is proposing a development called "Prairie View Ridge." The town and the city have a border agreement reached in 1994 but it doesn’t explicitly cover the Erdman property, which is located just north of the Pleasant View Golf Course, said town administrator David Shaw. The town hired attorney Richard Nordeng when it signed a border agreement with the City of Madison in 2003 and he likely would be used again, Shaw said. Board supervisor Timothy Roehl urged getting legal background on the town’s options because state law on incorporation has changed since the town last looked into it a few years ago. Miriam Share used to spend her Tuesday evenings singing in the Madison Symphony Chorus. As the newest member of the Middleton Common Council, she’ll now occupy those nights using her alto/soprano to vote “yay” or “nay” on policy decisions that shape the city’s future. Share ran unopposed for the council’s District 1 seat after incumbent Paul Kinne chose not to seek another term in the Spring Election. 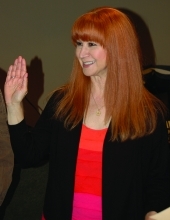 She was sworn in by assistant city administrator John Lehman on Tuesday night. While she’s a freshman councilor, Share is no stranger to the inner workings of city hall. She served as a citizen member on Middleton’s sustainability and arts committees, as well as running an unsuccessful campaign for the District 4 common council seat back in 2010. The Grant County Circuit Court has issued a decision in the John K. MacIver Institute for Public Policy’s case against Sen. Jon Erpenbach (D-Middleton). The court sided with the senator, declining to compel him to make public unredacted versions of emails he received during the political battle over Act 10. The MacIver Institute sought the information, claiming public employees using government computers to contact Erpenbach on the legislation may have violated the law preventing the use of public resources for a political purpose. Erpenbach had redacted names and email addresses before turning them over. When it rains, impervious surfaces – primarily pavement and rooftops - prevent water from soaking into the ground naturally. The result is a massive exodus of H2O. The water runs roughshod over the environment in its search for a place to go. It ends up in streams and lakes, but it causes extensive environmental damage on its journey, picking up sediment and pollutants along the way. On that much, at least, the Middleton Common Council is in agreement. But the council has been unable to reach a consensus about how to remedy the problem. Specifically, the council hasn’t yet come to terms with how to fund the confluence ponds and other features that help mitigate storm water damage.